DeLay told a packed room of reporters on Sept. 13 that 11 years of Republican rule had already pared down the federal budget "pretty good." If lawmakers had suggestions for cuts, DeLay said he would listen, but he was not offering anything up. But faced with a revolt among many conservatives sharply critical of him for resisting spending cuts, DeLay three weeks later told a closed meeting of the House Republican Conference, "I failed you," according to a number of House members and GOP aides. Then, in a nod to the most hard-core conservatives, DeLay volunteered, "You guys filled a void in the leadership." The abrupt shift reflects a changed political dynamic in the House in which a faction of fiscal conservatives -- known as the Republican Study Committee, or RSC -- has gained the upper hand because of DeLay's criminal indictment in Texas, widespread criticism of the Republicans' handling of Hurricane Katrina, and uncertainty over the future of the leadership, according to lawmakers and aides. DeLay's comments stirred a conservative movement that had laid dormant for several years. Most conservatives seemed willing to remain patient with the President as long as he needed to fight the war on terror and to fill empty appellate court seats. Grumblings among deficit hawks had been heard going back to the first couple of years of Bush's tenure in office but quickly silenced in the attacks on 9/11. Now, however, a series of missteps by the executive branch has made the RSC indispensable once again. First came Katrina, in the midst of an economic expansion triggered by tax cuts. The apparent abandonment of the cuts, as well as the odd choice of Harriet Miers to the Supreme Court, has re-energized the conservative movement within the GOP. Tom DeLay got far more humbled by Pence than anything Ronnie Earle filed against him, and while he's temporarily sidelined, he can't afford to be outspent or outgunned by other, more palatable conservatives. DeLay needs to re-establish some spending hawk credibility all over again when he comes back if he wants his old position back. George Bush and Tom DeLay have given the conservatives a dual shot in the arm. 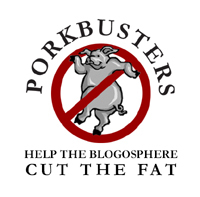 Operation Offset also has the benefit of working quite well with the Porkbusters operation in the blogosphere -- in fact, they appeared made for one another. Expect this to become a a larger factor in national politics from this point forward.